Rated Voltage: 120 ... 125 V d.c. Usable Current Range: 150 ... 170 A d.c. Note: if disconnected then the energy will self discharge due to internal resistance in approximately four to five days. Capacitors have numerous applications in electrical and electronic applications. This note examines the use of capacitors to store electrical energy. 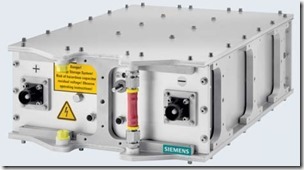 The sidebar shows details of a typical commercially available energy storage module. Note: some interesting schemes are being developed to overcome some of the disadvantages. For example, Shanghai is experimenting with super capacitor buses, called the Capabus. 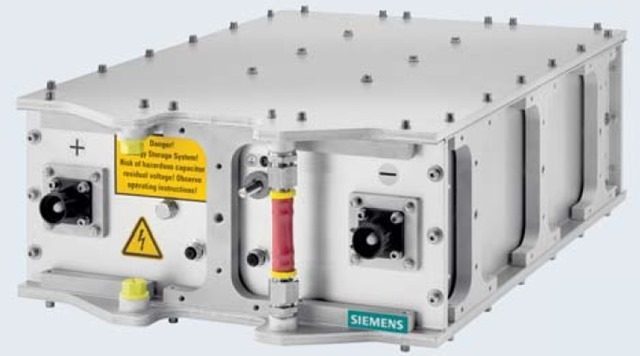 Siemens is developing a hybrid storage utilising both capacitors and batteries to be used in the powering of light rail systems. In both these applications, capacitors are quickly charged at stops or along the route by connecting to overhead charging points. Many energy storage modules will use electric double layer capacitors, often referred to as super capacitors. Super capacitors use a liquid electrolyte and charcoal to form what is known as an electrical double layer. This greatly increases the capacitance. Capacitors with large Farad rating and small size can be obtained. Note: due to having a large internal resistance, double layer capacitors are not suitable for a.c. circuits. For anyone not familiar with capacitor theory or needing a quick refresher, please review the Capacitor Theory note. The greater the capacitance or the voltage, the more energy it can store. When connecting capacitors in series, the total capacitance reduces but the voltage rating increases. Connecting in parallel keeps the voltage rating the same but increases the total capacitance. Either way the total energy storage of any combination is simply the sum of the storage capacity of each individual capacitor. Tip: one application of capacitors as part of a hybrid (capacitor/battery) energy system, is that they can help prolong battery life. Consider the above energy storage module (63 F at 125 V). What is the stored energy of one module by itself and then of two modules connected in series. Safety: capacitors store energy and will remain charged when disconnected from any supply. Before working on any capacitive systems which have been isolated from the power supply, be careful to take all necessary steps to ensure the capacitors are fully discharged. Hybrid energy systems (HES) employ capacitors in conjunction with batteries or to benefit from the advantages of both technologies while minimizing the disadvantages. Within a hybrid energy system the capacitors can charge and deliver energy more quickly, thereby reducing strenuous duties on the batteries. The batteries can achieve greater energy densities and provide for longer running duration. The use of this type of hybrid energy systems is becoming more popular, particularly in transportation applications. Hopefully, everyone now has a better understanding of using capacitor for energy storage. If anyone still has questions or any comments, please post below.